Juniors £6.00 per year (those aged 11-18 years or students in full-time education). *Membership fees are payable every April. New joiners will pay a half year subscription of £18 should they join after 6 months of the current subscription year. The Little Baddow Ridge Runners is a friendly running club based in Little Baddow near Danbury. We are a cross country running club and run off road on a Sunday morning (9.30am) and Tuesday evening (7.30pm). Please note that in winter and autumn, Tuesday sessions are on road due to the light. Most of our runs are off-road, lasting around an hour with a distance of around 5-7 miles. We understand that it can a nerve-wracking experience to join a new group of people, especially a running club where there will always be the inevitable concerns about whether you will be able to keep up. Rest-assured that there is nothing to worry about! We have a variety of groups to match different abilities and we won’t leave anyone behind or make you feel uneasy if you struggle at any stage. Running in a group is better for your motivation because on those weeks that you don’t really feel like it or just want to cut things short, others will encourage you to persist, push-on and build up your fitness and endurance. Running is a great, healthy pastime and most of us just run to enjoy ourselves and keep fit. There is the opportunity to take part in competitive events if you like. This could include the Mid-Essex X-country league which takes place between autumn and spring. There is also the Easter Trail race series along with a number of local trail races which are regularly organised by some of the other Essex running clubs available for you to participate in. We really do have runners of all ages, genders, backgrounds and abilities so whatever your motivation for running you will be fine. If you usually run on the road then don’t worry. It often takes people a little time to adjust to X-country running but we find that once this has happened most people become converts. 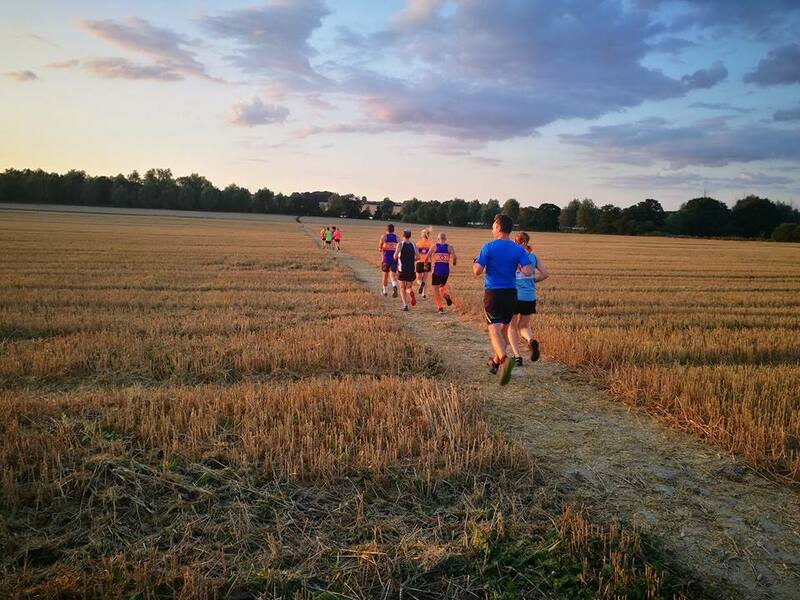 You will be able to run around some of the most scenic countryside in Essex and along footpaths and fields that you probably didn’t know existed! Running off-road is also much better on your joints and reduces the impact on any underlying injuries. So, what are you waiting for? If you are interested in joining us, why not get in touch and have a quick chat. Many of our runners can also be found at either Maldon or Chelmsford Parkrun so on Saturdays so if you spot the club vest just come and say hello. All runners under 18 years must be accompanied by an adult parent or guardian for insurance reasons. The club is a member of England Athletics and The Association of Running Clubs and associated with the Trail Running Association. All insurance and permits for events are obtained by way of one or more of these organisations. You will not be covered by our Public Liability insurance until you become a fully-paid member. The club has running leaders and coaches as defined by UK Athletics. All members agree to abide by the club rules as detailed in the constitution copies of which are available on this website and on the club noticeboard.